Winter opens its arms to the cold and flu season. Although the best way to prevent getting sick is to get a flu shot, be meticulous about hand-washing and practice safe food handling, eating foods that are rich in antioxidants and anti-inflammatory nutrients can help nourish the immune system and fight germs. These three recipes highlight some key ingredients with powerful germ-fighting, health-promoting properties. The steamy warmth of a rich chicken stock does more than clear the sinuses and provide old-fashioned comfort. 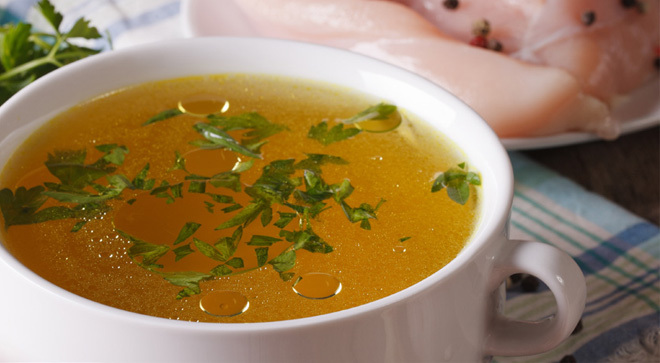 Study findings have shown that the amino acids in chicken soup can help ward off colds by reducing inflammation in the upper respiratory tract. This recipe includes some ginger and lemon. Ginger not only fights inflammation but also eases nausea, and lemon provides a touch of acidity to help extract more minerals from the chicken bones. Slow cooking over 3 to 6 hours helps break down the collagen (protein) into gelatin, which is easy on the stomach. Sip the stock on its own as a hydrating liquid, or use it as the base of a hearty soup that includes lots of other tasty, antioxidant-rich vegetables and herbs. When making the stock, remember to observe food safety. After straining the stock into a container, let it sit in a sink filled with ice water to bring down the temperature quickly and keep it out of the temperature danger zone. Refrigerate in quart-size containers for up to three days or freeze for six months. The grapefruit and avocado salad looks summertime fresh but is winter tough. Red grapefruit is an excellent source of vitamin C and lycopene, both of which provide antioxidant and anti-inflammatory assistance in fighting colds. 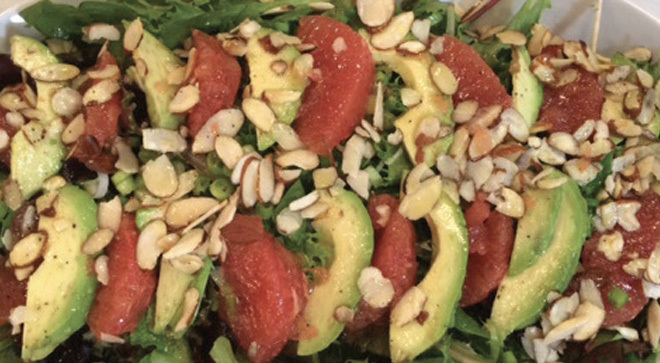 The avocado’s creamy counterbalance to the tartness of the grapefruit also contributes healthy monounsaturated fats, which boost absorption of carotenoids and fat-soluble vitamins A, D, E and K. Almonds contribute crunch, protein, fiber and vitamin E, another antioxidant. Any dark leafy greens can form the foundation of this salad — all are nutrient rich. Don’t forget to scrub the outside of the grapefruit and avocado before cutting into them; otherwise dirt and germs can contaminate the fruit inside. Can’t eat grapefruit? Substitute Cara Cara (navel oranges) or blood oranges for similar nutrients and a colorful pop. The combination of turmeric, garlic and ginger in Golden Confetti Cabbage is a trifecta of medicinal herbal delicious­ness. Many of the health benefits of the anti-inflammatory compounds in turmeric are attributed to curcumin, one of its constituents. The sulfur compounds in garlic and their positive effects on circulation and cardiovascular health are well studied. In Indian and Asian cultures, anti-inflammatory ginger also is known as a “warming spice” that can help detoxify harmful chemicals. Cruciferous vegetables have stood the test of time in cancer-prevention studies, and cabbage’s polyphenols, vitamin C and manganese exhibit strong antioxidant activity to reduce oxidative stress and cancer risk. 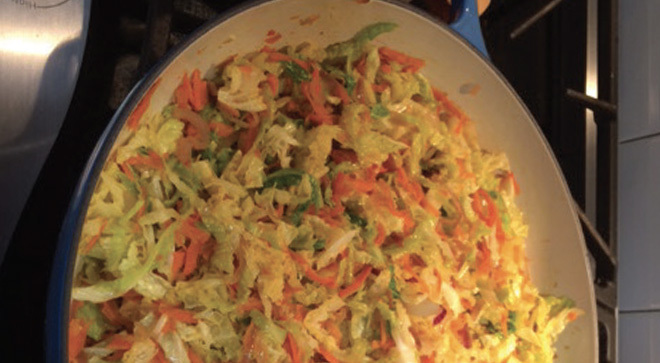 This dish, with its colorful and flavorful mix of red onions, orange carrots and green cabbage, ensures that many beneficial nutrients are represented at the table. A germ-free environment does not exist, but a strong immune system, fueled by delicious and nutritious ingredi­ents, can help promote good health all winter long. Put all the ingredients in a 12-quart stockpot. Keep ingredients submerged. Bring to a boil over high heat and then reduce heat to a slow simmer. Simmer over very low heat, partially covered, for at least 3 hours and up to 6 hours. Skim foam from top with a strainer. Add hot water if needed to keep ingredients submerged. Chill quickly in a sink filled with ice water. Skim fat and discard. Use stock to make soup or freeze in quart-size containers for up to 6 months. Add grilled shrimp or chicken for a main course salad. Remove the peel and white pith from the grapefruit. Working over a bowl, cut the grapefruit into segments. Reserve juice. On an oval platter, layer in order: greens, scallions, grapefruit and avocado. Sprinkle with the almonds. For dressing: In a small bowl, whisk the lemon and grapefruit juices, mustard, honey, salt and pepper. Add the oil, whisking vigorously. Just before serving, drizzle about half of the dressing over the salad. Pass remaining dressing. Heat oil in a large enameled cast-iron casserole. Add the onion and a generous pinch of salt and cook over medium heat, stirring occasionally, until softened, about 5 minutes. Add the garlic, ginger and turmeric and stir for 1 minute. Add the carrots with the broth or water and cook over moderate heat, stirring, until carrots just start to soften, 3 minutes. Add the cabbage in large handfuls, stirring each batch until it starts to wilt. When all the cabbage has been added, cover and cook over medium-low heat, stirring occasionally, until the cabbage is tender, 20 minutes. Season with salt and pepper and serve. Robin McConnell is the supervisor of clinical nutrition services at the John Theurer Cancer Center at Hackensack University Medical Center part of the Hackensack Meridian Health system in Hackensack, New Jersey. She is a board certified specialist in oncology nutrition.